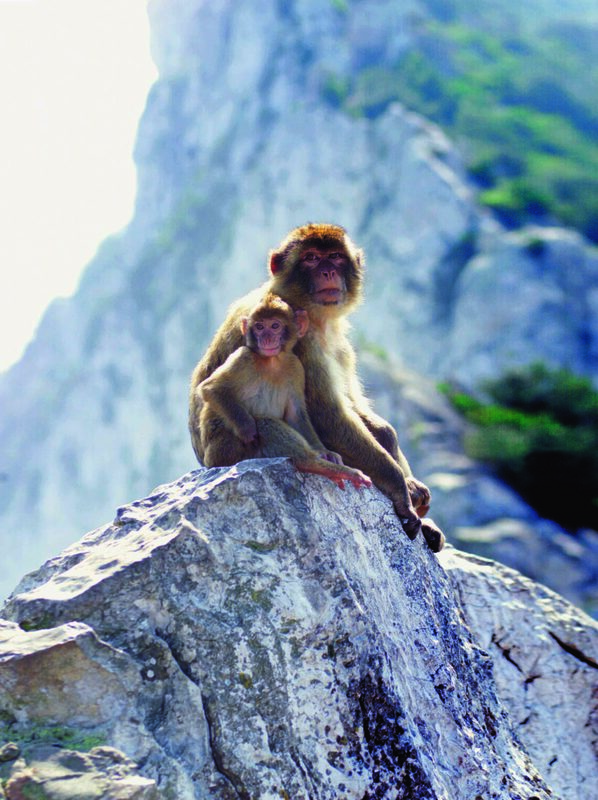 Home » architecture » Celebrities » Comedy » Comments » cookery » Countries » Creatures » Cruises » Cuisine » customs » Europe » Featured Articles » History » tours » Travel » Jane Wilson discovers there’s more to Gibraltar than The Rock! As the plane comes into land, the sighting of your hotel room winks at you from below – is that a hotel shaped as a ship or an ocean cruise ship docked in the harbour? Easy to find and around the corner – turn left out of the airport, cross the runway, (along with the other 6,000 Spanish and expats), turn right and the gleaming white yacht hotel awaits. The 5* Sunborn Hotel certainly has the novelty factor and is an attraction in itself. 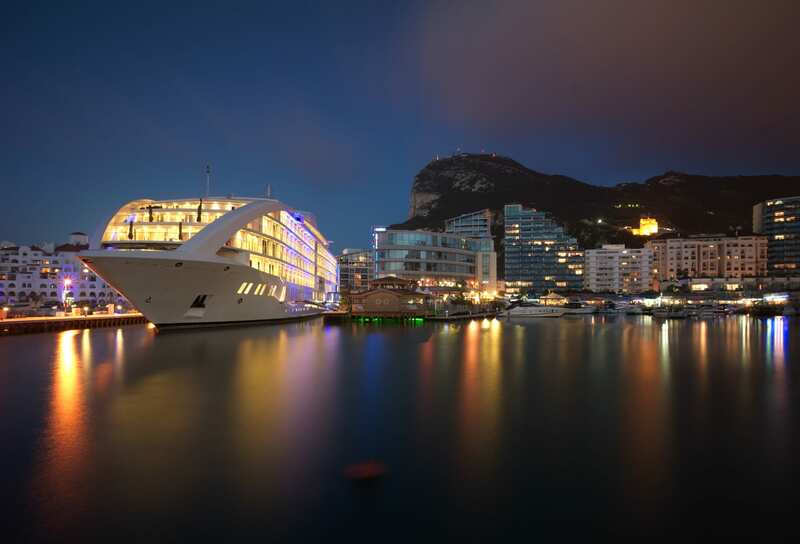 It is a defining introduction to a British destination and floats aside Ocean Village, the harbour district of Gibraltar. 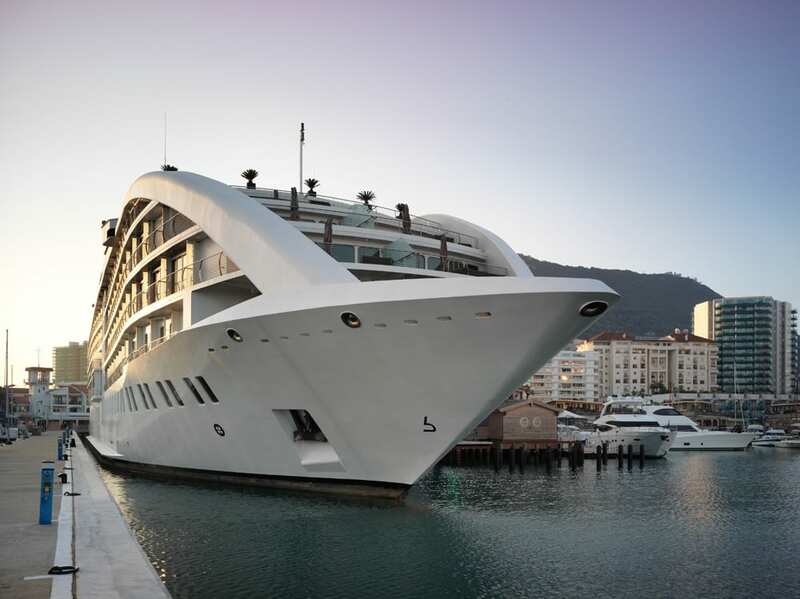 Built in the design of an ocean cruiser, complete with engines and a bridge, it was the first of its kind and has permanent residency as a yacht hotel. Although constructed 5 years ago, it still looks and feels new, providing a convenient place to explore Gibraltar with views over the sea to Spain and Morocco. And it’s unique! The entrance is like walking into Swarovski headquarters with a glittering backdrop to the reception desk populated with staff wearing welcoming smiles keen to show off the floating services. The corridors are wide, fitted with carpets that foot a jazzy design leading to rooms and suites, not cabins. They are tastefully designed, with quality furnishings, marble bathrooms and laced with technology that command a lesson to operate the drapes, lights and sound. And although there are several room types, surprisingly, the most popular are those with views over the runway! The Sunborn is also an entertainment hub, offering performances from tribute bands, comedy shows and a Fawlty Towers act which take place in its La Sala Restaurant & Bar. Here there’s a good choice on the menu, ranging from a Full Rack of BBQ Jack Daniel Pork Ribs, Crispy Won Toon Lasagne to Lamb with Cocoa, Chilli and Watermelon Pico de Gallo while there is a dedicated list of British classics such as Beer Battered Fish and Chips and Surf & Turf for those wanting to feel more at home. Service is excellent, dishes generous and attractively presented. Breakfast, buffet style, is served on the top deck in the Barbary Restaurant which it shares with a small outdoor pool and the Aqua Bar all with outlooks over the marina, the Med and the 1400-ft high Rock, a stature which can be seen some 100km away. The Rock, Gibraltar’s signature feature, is mostly formed from Jurassic limestone dating over 200 million years. Steep, narrow roads, originally built for donkeys and carts, twist to the upper rock allowing only registered taxis and mini-buses to transport visitors, although weather permitting, the cable car is another option. The journey, whatever form of transport used, is rewarded with enviable scenery. This destination is often described as the Cradle of History and well worth a visit with numerous statues and memorials to salute its past. There are 30 miles of World War tunnels snaking within the rock, a spectacular cave underneath, dolphins circling, Barbary apes prying, playing and monkeying around, and a cable car ascending its side. One day is not enough to get under the skin of this country. Clad in hard hats, the series of guided Tunnel tours are fascinating and factual and should be on the must-do list. They include The Great Siege Tunnels and can take up to 3 hours. The Mediterranean Steps walk is not for the faint-hearted but avoid carrying food, the monkeys will find it but will throw in free entertainment along the way. The Skywalk, opened by Mark Hamill from Star Wars fame in March 2018 is another look-out spot to take in stunning vistas. There are various organised tours which include the fishing village of Catalin Bay, Europa Point, the Mosque, the Moorish Castle and St Michael’s cave with a secret underground lake. As for wildlife, Gibraltar’s position between Europe and Africa, the Atlantic and Mediterranean make it an important crossing point for migrating birds, whales and dolphins. 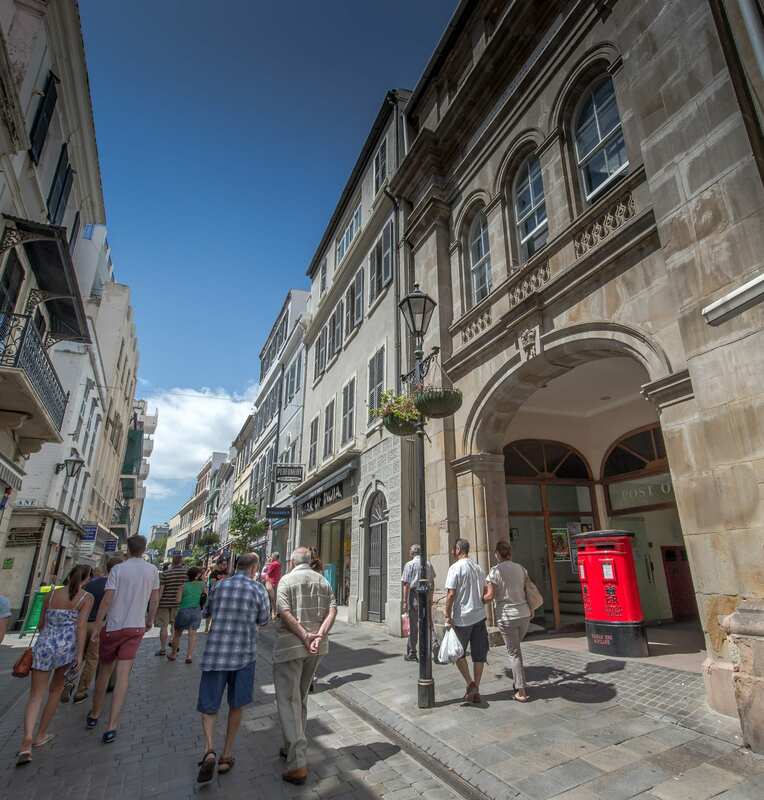 The old fortress walls surround the city with gate archways into Casemates Square which is dotted with restaurants and bars leading to Main Street the artery for shopping where familiar signs for M&S, Shepherds Pie and Morrisons are giveaway clues to its Britishness. But if you don’t want to travel around the Rock, then you can get a better view watching the opening sequence of James Bond’s Living Daylights, part of which was filmed here. And if you are thinking of tying the knot, then you will be following Sean Connery and John Lennon down the aisle – both of whom married here. Today it is one of the best places if you are in a hurry! Exhausted from climbing the Rock, brain overload from its history, frazzled from dodging the monkeys or weary from shopping on Main Street (sterling currency and Vat-free prices), then treat yourself back onboard to a relaxing treatment in the Spa or try your luck with a spot of gambling in the Casino. Gibraltar has proved itself to be more than a piece of Jurassic Rock! « Lateral Lyn’s Blog; Fighting to Get Fit & Save Money.